Twin Speak:DressCode: Soupy Sales: Comedian, Jazzman, Fan of Charlie Parker and Miles Davis R.I.P. 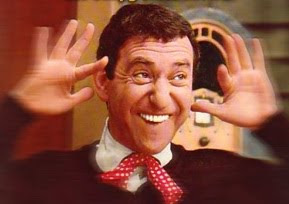 Soupy Sales: Comedian, Jazzman, Fan of Charlie Parker and Miles Davis R.I.P. From 1953 to 1959, while working in Detroit and hosting a late-night television comedy show, “Soupy’s On,” he made Charlie Parker’s “Yardbird Suite” his theme song. He took advantage of all the jazz musicians stopping through town to play local clubs like the Rouge Lounge and the Blue Bird Inn and the Crystal Show Bar. His guests included Duke Ellington, Miles Davis, Ella Fitzgerald, Billie Holiday, Stan Getz, Milt Jackson, Charlie Parker and Clifford Brown. And, no matter what he did, including his signature pie-in-the-face, he did in his own unique style. In case you don't know, one of his best bits was when he told kids to empty their mom's pocketbooks and send him the green pieces of paper with the faces on them. Kids did it...most of them sent him Monopoly money!